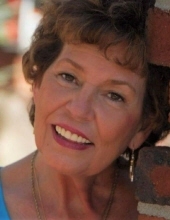 Mrs. Joan Pope Rutledge Morris, age 67, of Franklin, North Carolina, passed away Monday, April 1, 2019. Mrs. Morris was born June 2, 1951 in Rome, GA daughter of the late Ben and Lorene Pope. Joan was a feisty but sweet lady that loved her children, grandchildren and great grandchildren. She always loved to travel and spend time in her flower garden. She was retired from Wal-Mart having worked many years in the human resource department. In addition to her parents, she was preceded in death by her 1st husband, Curtis Van Rutledge; 2nd husband, Larry Morris; sister, Mary Pope; brothers, Arthur Pope and Benny Pope. Survivors include husband, Michael Capps; children: Pennie Bowen, Windie Bagby, Debbie Roebuck, Katrice Morris and Kevin Morris; 9 grandchildren; 4 great grandchildren and her sister, Rose Bell. Several nieces and nephews also survive. Funeral services for Mrs. Morris will be held on Friday, April 5, 2019 at 2:00 PM in the chapel of Smith & Miller Funeral Home with Mr. Woody Bowen officiating. Interment will follow in Polk Memory Gardens. The following gentlemen will serve as pallbearers: Danny Jones, Benny Pope, Lee Pope, Griffin Bowen, David Keasler and Thomas Butler. The family will receive friends at the funeral home from 12:00 until 2:00 PM. The Smith & Miller Funeral Home of Cedartown is honored to serve the family of Mrs. Joan Pope Rutledge Morris. To send flowers or a remembrance gift to the family of Joan Pope Rutledge Morris, please visit our Tribute Store. "Email Address" would like to share the life celebration of Joan Pope Rutledge Morris. Click on the "link" to go to share a favorite memory or leave a condolence message for the family.